Actually this is a sample question appeared in codejam contest conducted by mobme wireless. 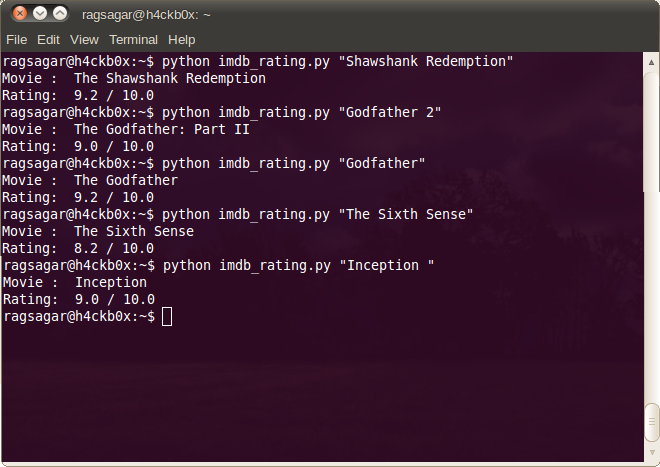 Imdbpy python module is used to retrieve movie informations from imdb. Write a program that ranks Hollywood actors based on the number of their appearances in a list of top 100 movies. There are a number of top movie lists on the Internet and it’s up to you to choose one. We’d prefer you choose one that has an open API. Here is a script i wrote last night.It finds imdb rating of a movie. Here is the screenshot of output.